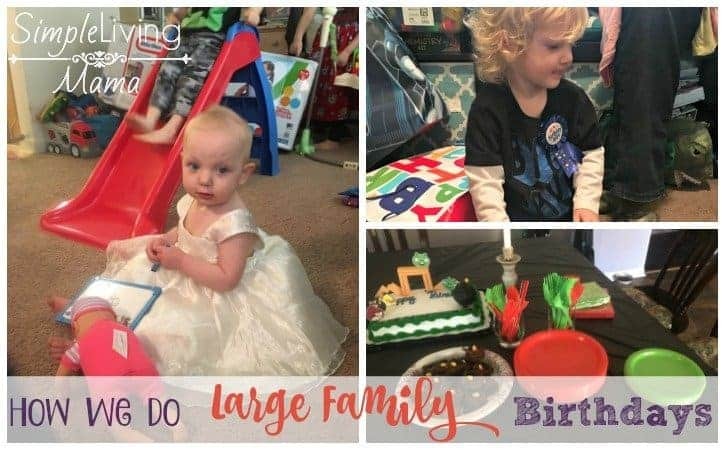 Let’s talk large family living! With baby #6 due to arrive in September, we have definitely crossed over from “average” family size, to make people stop and stare big family size. Now I know there are plenty of families out there with way more than six kids, but around here, six kids is a lot and makes for large family living. I think we are raising a large family, for sure. 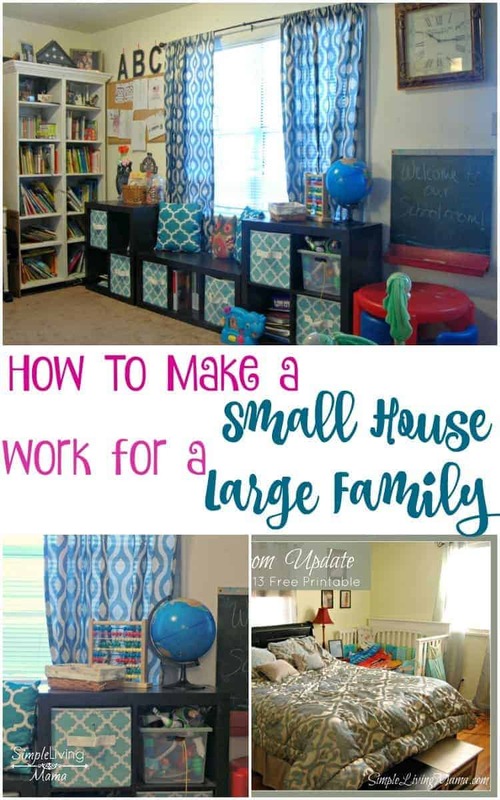 Today, I want to share with you my best tips for how to make a small house work for a large family. If you’ve followed my blog for a while, you know we downsized in 2015. We went from a 5 bedroom, 2,600 square foot house, to a 4 bedroom 1,500 square foot house. I wouldn’t necessarily call our current home “small,” but it is small compared to other homes that house families with smaller children in the area. Our smallest bedroom is my husband’s office, so technically we have three bedrooms for seven (going on eight) people. We have a boys’ room, a girls’ room, and our master bedroom. In the boys’ room there is currently a bunk bed. My oldest who is eight years old sleeps on the top, and my youngest two boys, who are four and two sleep on the bottom. They actually prefer to sleep next to each other, and it works out well. We will soon get creative with their beds when my youngest needs his own sleeping space by adding a trundle bed under the bunk. My oldest daughter who is six, currently has a room to herself. She has a full sized bed. Our youngest, who is 11 months, still sleeps in our room, and will until she is two years old. We have a Pack n Play for her in our room. When she is two, she will move to the girls’ room. She will most likely start out sharing the full size bed with my oldest daughter, and then get her own bed as she gets older. Right now, our kids don’t mind sleeping together, and actually prefer it. I know as they get older we will make new arrangements and configurations. If you have a large family, don’t be afraid to get creative with sleeping arrangements. It’s OKAY if your kids share a bedroom. It won’t damage them in the long run. Our house has two bathrooms, and hallelujah my husband and I have our own. Granted, it’s just a shower stall and a sink, but it works. We do live in military housing and even though this house is old, it has lots of great storage. Our kids’ bathroom, or the “pink” bathroom as we call it has a medicine cabinet, under sink storage, and a floor to ceiling storage cabinet. The kids’ teeth products are in the medicine cabinet. Towels, washcloths, and hair products are in the upper cabinet. On the top shelf I keep cleaning products and our vaporizer. The bottom cabinet holds our baby bathtub. I put command hooks on the wall so our kids can hang their towels to dry. Some families have given the children the master bedroom. In our home, we converted our “dining” room into the schoolroom. Some families use the living room as a dining room. You do not have to be bound by traditional rooms. 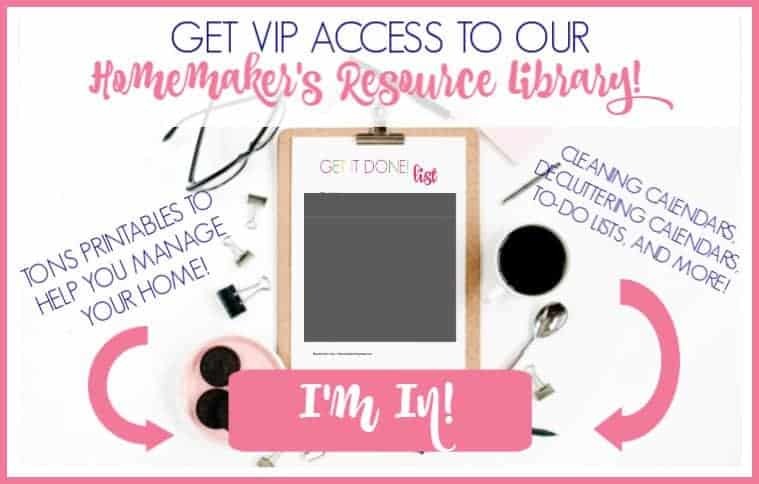 Get creative and make your house work for your family. I love having plenty of storage space, but with this many people. we still have to watch what we keep. Decluttering is a constant around here. In fact, I declutter so much, I’ve devoted many posts to it. We use bins and baskets. I love my storage system in our schoolroom. I’ve used plastic stacks of drawers as a dresser. The backs of doors make wonderful spots for hanging organizers. We use the space under our beds for more storage. What to do with the clothes? Finally, let’s talk about clothes. Lots of kids means lots of clothes. Both of the kids’s rooms have two dressers. I divide up the clothes among the dressers and also hang up their clothes in the closet. I’ve become more picky about what clothes I keep for storage, but I keep them boxed up by gender and size and store them in our hallway closet. When the next season comes around, I can just pull out a box for the younger kids. If you don’t have dresser space, don’t fret! A plastic set of drawers works well for baby clothes. Can you buy some under bed storage containers and use those for clothing? Once again, if you don’t have a traditional space for everyone’s clothes, think outside the box! Do you have a large family? What are your best tips for living in a small space? I use flat bins on rollers for the diapers under our bed. My office is a closet. We have 9 kids. The oldest had her own room. Then 3 girls share a room. And 2 bigger boys. Then the 2 little boys are between my room and their room and the baby sleeps with me full time. Flat bins under beds really help with storage! We have 9. We use what use to be a den for a kid closet. ONE day when finances allow we will move the washer and dryer in there. Only 1 dresser it’s the oldest everyone else have 2 cubbies and rest hangs on hanger. We turned an attic space into bedroom. Tools closest out of kids bedrooms for more space. We only have 2 but live in a 2 bedroom house with one closet converted to central air and heat. Vertical space is very valuable and hanging baskets for stuffed toys and high shelves are great for sometimes toys like playdough. We color coded linens with purple for one and green for the other with towels, hand towels, wash cloths, and chore baskets of the day. Each kid gets a basket with certain chores and their tools to do it. If they don’t pick up their towel or do their chore we know exactly who it was. i have four children and i am currently downsizing from a three bedroom to a two bedroom tiny house because of certian cercumstances however im super excited of what could come of it any tips would be awsome thank you for the encouraging post it helped make me feel better that im not the only one who had to downsize as a family. They do not all sleep together yet as the two younger tend to wake up earlier than the two older, but eventually there will be two on top and two on the bottom bunk. For now we have the two oldest together, who prefer to sleep together, on the top or bottom (they like to switch it up sometimes). The toddler has her own room and the baby has been moved into our walk-in closet that has been converted to nursery. It already had a window in it so it works perfectly. The newest addition always sleeps in our room next to my bed until about 4-6 months and then we will reassess sleeping arrangements. For clothing storage we use IKEA. We have all of the girls’ clothes in the oldest girls’ room. We have 4 stacking bin shelving units, one for each girl, that holds 4 medium sized bins and 2 small bins. They are in a row along the wall opposite the bunk bed. The small bins are for underwear, stockings, socks, leggings, slippers, etc… The larger bins are used for larger clothing. 1 for play clothes, 1 for pants/shorts, 1 for shirts, and 1 for pyjamas. I keep the bins on the same level for everyone as to make it easier for others to help with putting laundry away. My husband built a closet in the basement with shelving that fits the same bins so I have all the bins labeled by size and when it’s time for the clothing switch I take the old size down and bring up the new. Super simple system! He also converted their closet into a toy closet with each group of similar toys having its own bin. For example, Duplo blocks are in large bins on the bottom with smaller things like Little People in one small bin, magnetic dolls/clothing in one, tea set in one, toy cleaning supplies in one, etc… There are 2 shelves above the toy organization the first holds larger items and a few more medium sized bins with puzzles and such. The top shelf holds a bin for each girl containing sweaters/ sweatshirts. The closet in the toddler’s room is the clothing closet for all 4 girls. Right now all of there dresses/skirts fit on one rack but soon my husband is going to put in a lower rack which will give me extra space to spread out the clothing a bit as the girls grow. As our family size increases the plan is to make the toddler’s room look like the other room with another big bunk. The shelving units are already in place in that room. Right now I store baby blankets, baby toys and books in these bins. I store all of my extra diapers/wipes/Pull-Ups under the crib/toddler bed. My mother-in-law used a toy library system. She had bookshelves lining the hall and used plastic shoe boxes for different sets of toys. The child/older child/mother could pull out one bin at a time (unless it took more than one bin to contain the same toy) and then had to play with that toy for a minimum of 15 minuets before requesting another. The bin must be cleaned up and returned to receive a different set of toys. Hope this was helpful. It sure has made my life a whole lot simpler! Thank you for all of that information. That is so helpful!